*The $750 College Graduate Rebate must be used as a down payment on a retail installment contract or as a capitalized cost reduction on a lease agreement through Southeast Toyota Finance. Only one College Graduate Rebate per customer. Verifiable proof of recent or upcoming graduation or graduate school enrollment status is required at the time of lease/purchase. Must meet credit approval requirements and have no negative credit history. Must furnish proof of present employment or future employment with a start date within 120 days of credit approval. Not all applicants will qualify. All other terms and conditions of the College Graduate Rebate Program apply; see dealer for details. 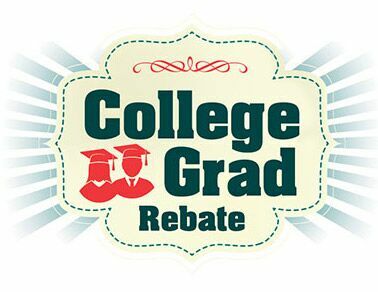 The College Graduate Rebate Program may be combined with certain other special offers from Southeast Toyota Finance. This offer is available at any Toyota dealer in AL, FL, GA, NC, and SC. In addition, your dealer can advise you about additional offers for which you may be eligible.